Hunters are placed in high seats from where they have an elevated overview of a large or small area of the forest. 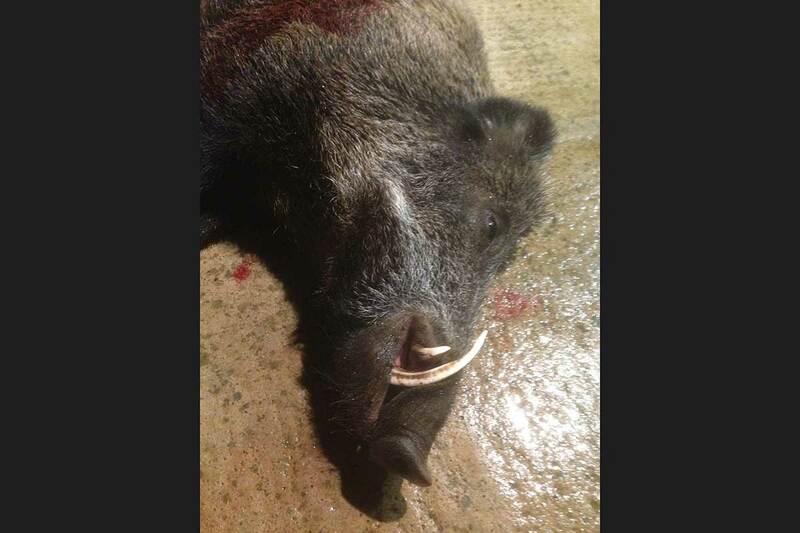 Rifle hunting may take place with calibers adequate for wild boar hunting. A riflescope with an illuminated reticle is definitely preferable as hunting also takes place under moonlight conditions. Adequate rifles (7 mm Rem. Mag. calibers with 3-12×56 illuminated Zeiss scopes) can be rented at Domaine Bois de la Gineste. Domaine Bois de la Gineste also provides outstanding possibilities for bowhunting. Hunting stays are made for groups of four to eight hunters or two to four hunters accompanied by their spouses. Hunting takes place at sun-up, sun-down as well as at moonlight except in cloudy conditions. 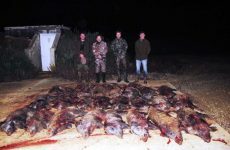 Hunting arrangements normally include two to three days of hunting starting with sunset and moonlight hunting on the day of arrival. The hunting stays include accommodation and full board including wine and drinks. Hunts are arranged the whole year. For wild boarhunts ideal periods are the days up to full moon. Another typical wild boar parade for one night. Two French hunters with keiler trophies.